This is another in a series on celebrity authors. Brian Sutter made his NHL debut with the St. Louis Blues in the 1976-77 season. Over the next several seasons, his brothers Darryl, Duane, Brent, Rich and Ron made their NHL debuts. There has been at least one Sutter brother playing or coaching in the NHL since Brian's debut. For about 13 of those seasons, there were all 6 Sutters playing or coaching in the NHL. The Sutter family story is one of determination, perseverance and togetherness. It is a story that needed to be told and fortunately, Dean Spiros did just that in Six Shooters:Hockey's Sutter Brothers. Spiros was a sportswriter at the Daily Herald when he first asked Darryl Sutter (then with the Blackhawks) about a book. Others had asked before, but never the right one, according to Sutter. Sutter believed in Spiros and the rest of the brothers agreed. I asked Spiros what inspired him to want to do the book. Spiros said, "One thing very important to me is to tell the real story not simply a story. The Sutters are as genuine as anyone you will find in or out of professional sports. Their story jumps out at you because of the incredible odds against one family having that many sons reach the professional level." Six brothers reaching the top level is unprecedented. Actually, there might have been seven, had oldest brother Gary stuck with hockey. Instead Gary chose a different path. Gary's story by itself could probably make for a great book. According to Spiros, "Gary is different in a lot of ways. He was the only defenseman among the seven brothers and I am told by the others that Gary was the most talented. I also think he is the most sensitive. I think if Brian had been the oldest and Gary was next he would have learned from his brother that going away at such an early age was not as scary as it seemed to him at the time." In Six Shooters, we learn more about Gary and the Sutter parents (Louie and Grace), as well as others dear to the family. Spiros covers Marg and Walter "Stubb" Ross, who gave the Sutter boys a home while each played in Lethbridge before being called up to their respective NHL team. The experience at the Ross home "is testimony to the community spirit that exists in hockey," said Spiros. That community or family spirit remained with the Sutter brothers wherever they went. Stories like that add warmth and another layer of familial bonds to the Sutter story. Each Sutter left a mark wherever he went. Spiros spends about the last 60% of the book on the six brothers individually, letting each tell his story in his own voice. It starts with Brian who found his new home with the St. Louis Blues. Brian quickly became fiercely loyal to the Blues, even retiring to become their coach. He also became the first (and only to date) Sutter to have his number retired. As the others followed, more great stories come out. Darryl discusses his triumphs and struggles in Chicago. Duane recounts the Stanley Cup and his time with the Islanders. Brent talks about the Canada Cup and being named Captain of the Islanders. Rich tells of being traded and playing for Brian in St. Louis. Ron discusses the great teams in Philadelphia and the tragedy of Pelle Lindbergh. These are just some of the interesting tales. Each has many more, but each could also probably fill his own book. I asked Spiros how he was able to condense things so neatly, while still giving the full story. Spiros said, "The Publisher made the call on how long the book should be. I definitely could have written a lot more. I tried to concentrate on the family aspect. They really are each others' best friends as much as they are brothers." The family theme comes through very clearly. Each Sutter mentions other Sutters often, while also counting other teammates and coaches as family. Men like Barclay Plager, Al Arbour, Kelly Kisio, Jacques Demers and so many others share a deep love and respect for the Sutters. They are as close as family. In the twenty years since Six Shooters was released, the Sutters have experienced a lot. All became coaches and/or scouts. Children were born, raised and started their paths toward the NHL. As the second generation started to play professionally, I wondered about a book sequel. Spiros said, "I thought many times about updating the book. I don't know how much of a market there is for hockey books these days, but I would love to do an update." I am a long-time fan of the Sutter family. Fan or not, Six Shooters is a great book. It's a book of inspiration, determination, hard work, family ties, love, friendships and great hockey stuff. 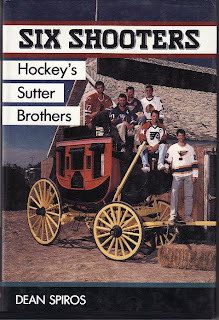 I would be first in line for another book updating us on the Sutter legacy. I would like to thank Dean Spiros for his contributions to this piece. Spiros is a native of Oak Park (IL) and was a sports writer for the Daily Herald from 1982-2000. Since then, he has been at the Minneapolis Star-Tribune. Spiros can be reached at dspiros@startribune.com. Dean Spiros, author of Six Shooters:Hockey's Sutter Brothers. I read that book. Great to learn a bit from Dean! Great book. Spiros did a great job in covering the Sutter boys.